Errorama 2003 is now history, but the events that took placing during those four days will linger for quite some time as a pleasant memory. Activity was brisk at the club table, with a constant stream of new and old faces stopping by. We sold quite a few CONECA 20th Anniversary commemorative medals and signed up a lot of new members. There were a number of nice error exhibits not directly associated with Errorama. The winning exhibit was a very informative survey of state quarter errors. Bob Entlich’s staggering display of buffalo nickel errors stopped people in their tracks. Also making a splash was Ken Hill’s fabulous buffalo nickel that evidenced catastrophic die failure. Mike Diamond’s lecture on errors not found in standard references and his lecture dealing with mystery errors were well-attended and well-received. Unfortunately, none of the mysteries he presented were solved this time around. Two Cherrypicker’s Awards were given out. Mike Ellis won in the varieties category for both the quality and quantity of die varieties that he plucked (a whole box full). 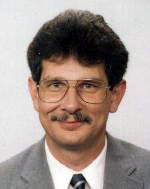 Jim Checkovich won in the planchet and striking error category. The highlight of Errorama was, of course, the banquet. It was held in a semicircular dining room at the top of the Holiday Inn, overlooking Camden Yards. The buffet selection was tasty, varied, and bountiful. Dignitaries in attendance included David Harper of Numismatic News, Eric von Klinger of Coin World, and Gary Lewis, the newly elected President of the ANA. Chris Pilliod gave a two-part talk. His first installment was a tongue-in-cheek account of his efforts to make his presentations more exciting. He concluded that the way to keep an audience’s attention was to “be the coin”. So, for example, when speaking of die caps, it’s advisable to wear a bucket on one’s head. The second half of his presentation concerned double struck large cents featuring an initial off-center strike and a second centered strike. The second strike seems to have been an intentional attempt to salvage a coin that was accidentally struck off-center. Attempts to salvage such off-center cents were eventually abandoned, presumably because it was not cost-effective. A “Winner’s Windfall” auction was held along with a raffle. I think everyone was pleased with their winnings. Everyone got a door prize consisting of James Wiles’ “The Jefferson Nickel RPM Book Update: 2001-2002. Twice the usual number of awards were given out at the banquet, as they included those for both 2002 and 2003. The list of winners and the text to citations are listed below. Held At Errorama 2003The drawing for the winners listed below was held at the CONECA 20th Anniversary Banquet in conjunction with Errorama at the ANA show in Baltimore on Friday August 1, 2003. It brought in $3,255.00 to the club treasury! CONECA thanks Xan Chaimberlain and Paul Funaiole for coordinating the effort and everybody who donated items and/or purchased tickets! 1) David K. Dowler won the 1979 Susan B. Anthony $1.00 – Broadstruck – ANACS MS64 (donated by by Xan Chamberlain). 2) Mark Tumblin won the 1946 S Roosevelt 10 cents NGC MS67 RPM # 1 (donated by Paul Funaiole). 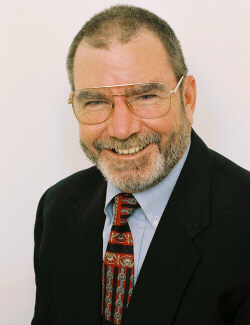 3) Ronald C. Van Dyke won the 1999 P Georgia State Quarter – BU – Off Center (donated by Ken Potter). 4) Felix J. Dausilio won the 1999 $5.00 Gold – BU – Obverse Doubling on Liberty (donated by Xan Chamberlain). 5) Garland McKelvey won the 1961 Proof Franklin Half – SEGS PR65 – DDR-1(donated by James Wiles). 6) James M. Ellis won the 1959 Franklin Half Dollar –BU – DDR – Breen # 5251, Type II over Type I Reverse (donated by Ken Potter). 7) Jeff Harris won the Collection of errors – Blank Planchets, Laminations, Die Clashes, Misaligned Dies, Doubled dies and a roll of wheat cents that says “errors” 70 + coins in all (donated by unknown). 8) Kwan Y. Shek won the 1998 and 1999 – BU – Off-Center 5 Rupees pieces from India (donated by Ken Potter). 9) Scott K. Salzsieder won the Set of Six Silver Quarters: 1953 S/S ANACS MS63, 1941 S Large Mint Mark, 1952 S Tall Mint Mark, 1956 Type B Reverse, 1957 Type B Reverse, and 1960 Type B Reverse (donated by James Wiles). 10) Edward Clark won the 1971 S Ike Dollar – SEGS MS63 – Doubled Die Obverse # 7/ WDDO-4 (donated by James Wiles). 11) Robert L. Parlock won the BU 1998 Brass Cent Set – One Brass Plated and one Copper Plated (donated by Ken Potter). 12) Jay Fackelman won the BU 1960 D RPM Set, including #s 5,7,29,32 and 33 (donated by Ken Potter). J.T. Stanton has proven with over a decade of service to both CONECA and the EV hobby at large that he deserves to be the next inductee into the CONECA Hall of Fame. J.T.’s loyalty to the club has never been in doubt. He has donated not only time and coins, but also money and professional services, and has done it all with an attitude of humility characteristic of the Southern gentlemen he is. I am proud to call J.T. a friend, a confidant, and in many ways a mentor. He demonstrates with bold colors the essence of what the CONECA Hall of Fame stands for; a lifetime of service to CONECA and the EV Hobby above and beyond the call of duty. J.T. is probably most widely known as co-author of the Cherrypickers’ Guide to Rare Die Varieties; now in its 4th edition. Ken has been a strong supporter of CONECA for many, many years. Since the elections in December of 2002 and his new responsibilities as Webmaster, Ken has poured many hours into the development of our website. Many of the ideas we have tossed around for a couple of years have now come to fruition due to Ken’s efforts in this area. The addition of rotating teasers and the start of a collection of articles for study and research are just two of the focuses that IMHO have brought the website to the forefront. In addition Ken inaugurated the concept of an anniversary medal, agreed to upfront the money, and manage the program for our 20th anniversary. Ken’s hard work and dedication to the club have qualified him as CONECA’s most outstanding member for 2003. Ken couldn’t be with us this evening, but he has been notified of his award and his plaque will be mailed to him. Congratulations Ken and Thank you. Timothy has been a CONECA member for about 5 years or so. He got off to a rocky start, teetering between us and NCADD but finally settled on CONECA for his main service to the hobby. For those who haven’t met Timothy, he has become IMHO, CONECA’s ace cherrypicker. It took him a couple of years to hone his eyes to telling the difference between hub doubling and the many types of false doubling prevalent on our coinage. But, over the last 5 years he has sent me multiple hundreds of coins for attribution. Indeed a close inspection of the Master Listing will reveal that Timothy has reported a tremendous number of coins for listing. Our ability to rebuild the CONECA Master Listing of 20th Century Doubled Dies in 2002 was due in large part to Timothy’s cherrypicking and willingness to support the club by sending in his coins for attribution. 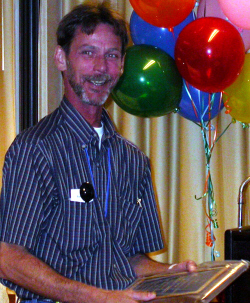 Timothy’s generosity in sharing his finds with the club have qualified him as CONECA’s most outstanding member for 2002. The Lyndon King Award is about short-term service to CONECA above and beyond the call of duty. Timothy did not have to send his coins in to be attributed against the club’s files. He could have sold them, as do many others, as unattributed or inaccurately attributed varieties. But he chose the harder and more determined route. He sent in his coins and he paid the attribution fees as well. Many members only want information from us without having to pay for it or without having to give back. Don’t get me wrong, I’m not complaining, every coin I see helps the files become that much more accurate and complete. What distinguishes Timothy from the others, is that he kept coming back, year after year and with handfuls of coins each time. He understood our need and took pains to help us out. If Timothy had not shared his coins, our files would still be in shambles. Some may say they are just doubled dies and RPMs, but variety collecting is at least half of what makes CONECA the club it is. Timothy portrays the kind of member who gives as much if not more than he receives. He is being honored for that attitude. It is this kind of attitude that will make the future of this club as glorious as its past. Timothy is an excellent model for the Lyndon King Award. Dr. King himself, held no leadership position, but he gave more than he received. Timothy on behalf of CONECA I present you this plaque as the 2002 recipient of the Lyndon King Award. Congratulations and Thank you. Kenny Knapp Awards for 2002 and 2003 (for recruiting 25 or more new members): Scott Klynstra, Len Roosmalen, Fred Weinberg, Lee Gong, and James Wiles.